Kenneth Watson is Professor Emeritus of Physical Oceanography at University of California, San Diego (1991-present). Other institutional affiliations include University of California, Berkeley, Indiana University and University of Wisconsin, Madison. His research interests include internal wave turbulence, quantum mechanics, and collision theory. September 7, 1921Birth, Des Moines (Iowa). 1943Obtained BS in Electrical Engineering, Iowa State College, Ames (Iowa). 1943 – 1946Researcher, Naval Research Laboratory, United States Navy. 1948Obtained PhD in Physics, University of Iowa, Iowa City (Iowa). 1948 – 1949Atonic Energy Commission (AEC) Fellow, Institute for Advanced Study. 1949 – 1951Atomic Energy Commission (AEC) Fellow, Radiation Laboratory, University of California, Berkeley, Berkeley (Calif.). 1951 – 1954Assistant Professor of Physics, Indiana University. 1954 – 1957Associate Professor of Physics, University of Wisconsin, Madison. 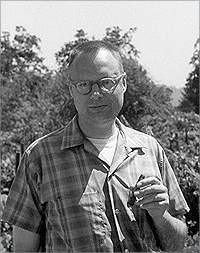 1957 – 1981Staff Member, Lawrence Berkeley National Laboratory. 1957 – 1981Professor of Physics, University of California, Berkeley, Berkeley (Calif.). 1974Member, National Academy of Sciences. 1981 – 1991Director, Marine Physical Laboratory, Scripps Institute of Oceanography, La Jolla (San Diego, Calif.). 1981 – presentProfessor of Physical Oceanography (1981-1991) and Professor Emeritus of Physical Oceanography (1991-present), University of California, San Diego, San Diego (Calif.). PhD Advisor at University of Iowa, "The polarizability of the meson-charge cloud of a neutron in an external electrostatic field". Advised by Watson at University of California, Berkeley, "Correlation of photons from a thermal source". Both employed at Indiana University. Both employed at the Institute for Advanced Study and University of California, Berkeley. Both employed at the Institute for Advanced Study. Both employed at University of California, San Diego. Both employed at Lawrence Radiation Laboratory and University of California, Berkeley. Atomic Energy Commission (AEC) Fellow and Staff Member. Scripps Institute of Oceanography. Marine Physical Laboratory. University of California, San Diego. Institute of Geophysics and Planetary Physics. Professor of Physical Oceanography and Professor Emeritus of Physical Oceanography. Atomic Energy Commission (AEC) Fellow. Oral history interview with Kenneth M. Watson, 1986 February 10. Murray Gell-Mann papers, 1931-2001 (bulk 1955-1993). Oral history interview with E. A. Frieman, 1986 June 26. Oral history interview with Edward A. Frieman, 2006 December 4 and 5. Oral history interview with Francis Eugene Low, 1986 April 29. Oral history interview with John Archibald Wheeler, 1988 May 4, May 23 and November 28. Oral history interview with Keith Allan Brueckner, 1986 July 2. Oral history interview with Marvin L. Goldberger, 1986 February 12. Oral history interview with Stanley Martin Flatté, 1986 July 2. Atomic theory of gas dynamics / by John W. Bond, Jr., Kenneth M. Watson [and] Jasper A. Welch, Jr.
Collision theory / Marvin L. Goldberger, Kenneth M. Watson. Topics in several particle dynamics [by] K.M. Watson and J. Nuttall, with a chapter by J.S.R. Chisholm.